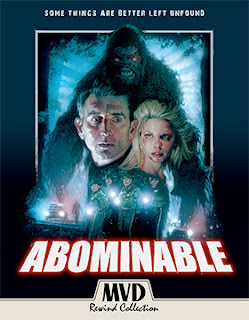 MVD Entertainment Group has tabbed June 12 as the street date for a new 2K restoration (from the original 35mm camera negative) of writer/director Ryan Schifrin’s 2006 creature-in-the-woods thriller, Abominable. Available on that mid-June date will be a Blu-ray/DVD Combo Pack edition, which sports an “all new cut” of the film — featuring up-dated CGI-effects — as supervised by filmmaker Ryan Schifrin and film editor Chris Conlee. This movie is so much fun and now with updated f/x and this new HD transfer it is going to be even better … like seeing it for the first time! Preston Rogers (Matt McCoy — immediately recognizable as L.A. Confidential’s “Badge of Honor” star Brett Chase … plus such films as DeepStar Six, The Hand that Rocks the Cradle, etc.) is recovering from a horrendous climbing accident and is pretty much wheelchair bound and reliant on his nurse/caregiver (played by Christien Tinsley). He settles down in a cabin in the woods. This is the first element … sort like James Steward’s Jeff character in Rear Widow, only without Grace Kelly to be his legs. Next door to his little cabin in the woods is another cabin, which is the vacation digs of a quintet of young women (aka: victim pool), who conveniently make up the second element of the story. And finally, from a little prologue featuring Dee Wallace (Howling, E.T., Cujo, etc. ), we have Bigfoot (call it what you will), a hulking creature who dines on horses … and soon enough gets a taste for human flesh. Preston spots the beast and tries his best to warn the nubile young ladies across the way, but quite naturally they view his window gazing episodes as that of a pervert. He tries warning the local sheriff, but to no avail … nut job, crank caller, etc. Now all of this could have easily gone off the rails, but Schifrin’s clever script, the addition of genre icons Dee Wallace and Lance Henriksen as cast members, plus scream queen Tiffany Shepis and Haley Joel as the resourceful Amanda (not to be confused with Haley Joel Osment) all come together to make Abominable a terrific creature feature.